Wait, so people are buying Chromebooks after all? 21 per cent of all laptop sales? For reals? Google's minimalist Chromebooks, like the excellent HP Chromebook 11, came from practically nowhere in 2013 to amass 21 per cent of all notebook sales leading into the festive season, according to new data. NPD claims the inexpensive laptops, running Google's web-centric Chrome OS, racked up more than one fifth of sales from January until the end of November. That's up from a near-insignificant 0.3 per cent of all sales. 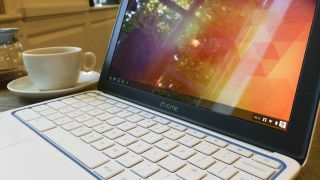 Better still for Google and Chromebook manufacturers like Acer and Samsung, the sales momentum appeared to picking up heading in December, NPD claimed. If the figures can be trusted - and they are extremely surprising - Chromebooks also accounted for 9.6 per cent of all laptop and tablet sales during the year. Another interesting metric shows Chromebooks currently sitting in three of the top four spots in Amazon's best-selling laptops list. Are Chromebook's set to have an Android-like year in 2014, en route to dominating the laptop market and taking down Mac OS X and Windows 8 in the process? All of a sudden it doesn't seem like such an outlandish concept. Chromebooks may be making dents in the consumer market, but are they ready for business yet? We go in depth.